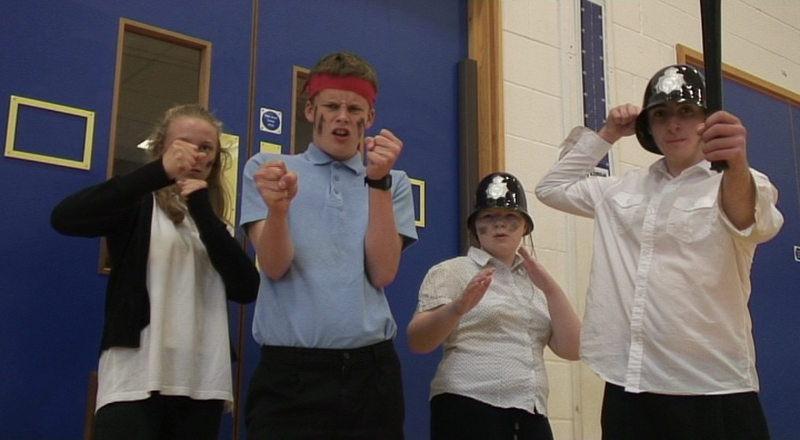 T.A.N.K.S was one of the films made by young people through the Oak Grove Film Project, a peer mentoring and integration project that brought mainstream young people and young people with special needs together to make short films. Workshops explored genre, technical filmmaking skills, script writing and development, casting, stage fighting, props making, acting techniques and direction. 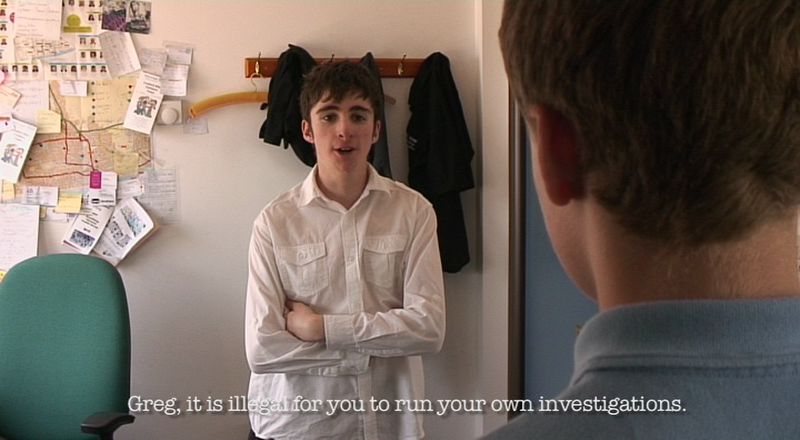 In the first year of the project the young people made a science fiction film, an outcome decided by the project organisers. For the project’s second year I wanted the young people to have more ownership of what they made, so I wanted them to select the genre themselves. In order to present the group with their options I ran a series of workshops on genre looking in particular at genres that were easy to define stylistically and visually such as Horror, Western, Thriller, Action and Adventure. In each workshop I would show film clips as examples in order to prompt the group to pick out the defining elements or ingredients of each genre. We looked at the visual style, basic story structure and archetypal characters within each genre and explored the associations that the group had with each type of film. The group then voted for the genre that they would like to work in, choosing to make an Action movie. With the genre selected, we then began to explore Action in more depth looking at films like Die Hard, Hot Fuzz and Kung Fu Hustle. The group explored a workshop on the action hero, looking at the typical personality traits of an action hero, their journey to becoming a hero through the course of the story and their relationship to other characters such as a sidekick, a love interest (who finds herself in danger) and an authority figure who challenges the hero’s methods. With our understanding of the action hero complete, I then led a workshop that looked at the villain’s role within the genre and the ways in which the villain can be compared and contrasted with the hero. We also looked at his henchmen and cronies. To begin generating ideas for our film, I ran a workshop in high concept movies – films with a simple premise that can be explained in one sentence. The group were asked to identify a number of films from their high concept descriptions and then began creating and pitching their own high concept premises for the film. The aim was to establish a threat for our hero to fight against as this would provide the basis of our plot. We played around with a lot of ideas, established which concepts were the most popular choices and then began to swap and combine elements until we had a story idea that everyone agreed on. The threat was an evil headmaster with a brainwashed army of school children – Totally Awesome Ninja Kids – giving us our title, TANKS. With our characters identified and a premise on which to build our plot, I then led the group in exploring the hero’s journey more closely and used story structure, along with all of the genre ingredients we’d already listed, to map out a blueprint for a typical action film plot. This blueprint followed a recognizable three-act structure that the group were able to apply to a number of action movies that they were familiar with. This plan outlined roughly ten scenes in which our hero notices something suspicious, investigates, identifies the villain and meets a series of obstacles before finally defeating the enemy. We were then able to slot our story ideas and ingredients into the blueprint and soon had a full story outline for the writers to work with. The group split into two working groups for the screenwriting process with a group of writers discussing ideas and drafting scenes while a group of actors improvised scenes and characters. 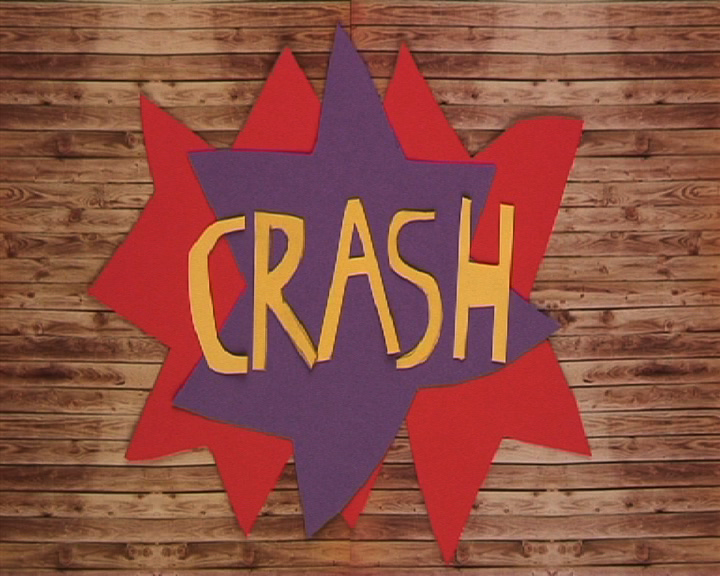 Each week the two groups would feed each other ideas with the writers suggesting scenes or characters for the group to improvise and the actors performing them. I felt that this was a good way for those who didn’t want to write to still feed their ideas into the script and influence the story. Improvisation can be really useful to help writers come up with new ideas or fill in gaps in the story that they might be struggling with. Castings were filmed and done in groups so that people could also try out for crew roles and get in some practise with the kit. The film needed to be high energy. Obviously car chases weren’t possible and so our chases had to be on foot. 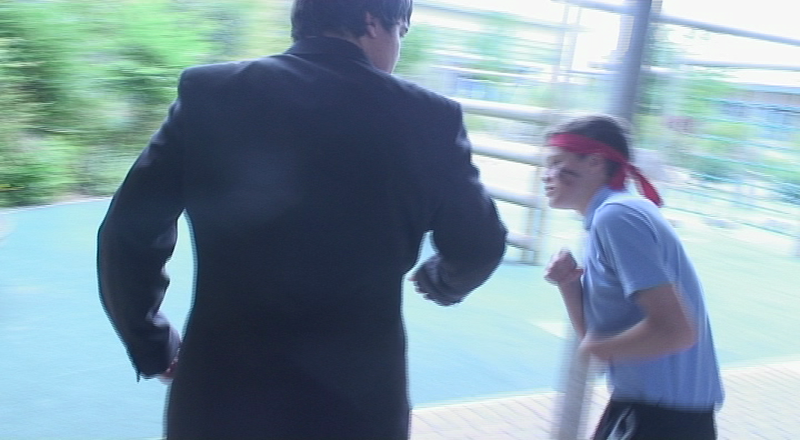 We also had a stage fighting workshop in order to learn safe fighting techniques for the film and devise our onscreen clashes. This was a particularly fun day. 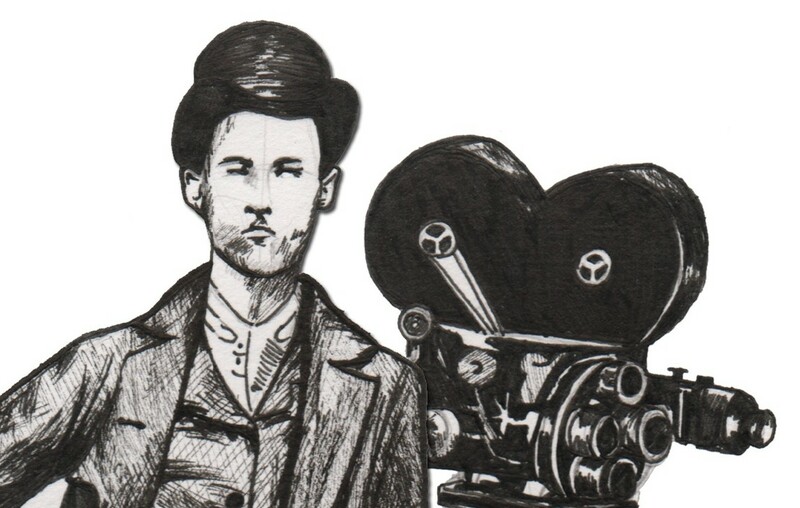 To find out more about my community filmmaking projects and workshops, please visit my website. This entry was posted in Portfolio, Short Film, Youth Project and tagged action, action hero, Community, Evan Makes Films, Evan Wilkinson, evwilko, fight, Film, Filmmaking, genre, Media, Oak Grove, police, production, Short Film, Special Needs, stage fighting, TANKS, Workshops, Worthing, Worthing Youth Media, Youth, Youth Project on January 24, 2014 by Evan Wilkinson. 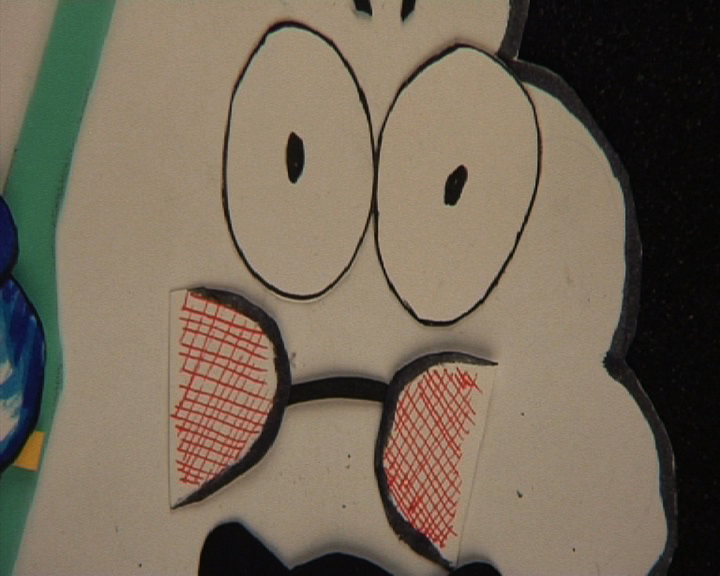 Happy Cloud was an animated short film made by young people from Worthing Youth Media and funded by First Light. I ran this project, leading workshops that took the group through the process of developing their idea into a finished film. I helped the group to write and edit their script, design the characters, draw up storyboards and put together an animatic, then led them through animation workshops before the shooting of the film itself. Happy Cloud was an idea that went through a lot of development. 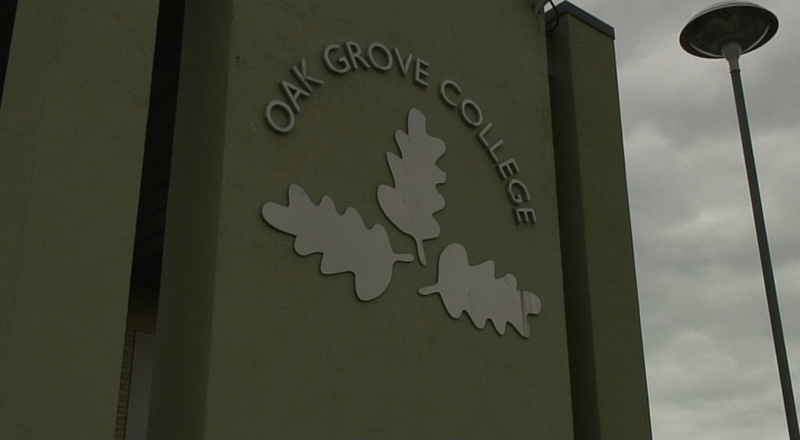 It was originally a short project that I ran workshops for in the summer term of 2008, but when the group’s application for First Light funding was successful, they decided to develop it further. 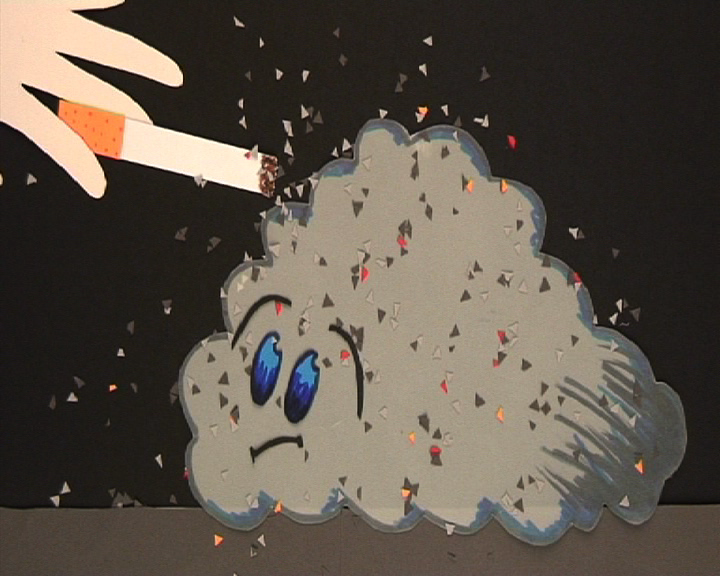 The original Happy Cloud was a short viral ad in which Happy Cloud smiled gleefully while a narrator spoke to him in voice over. 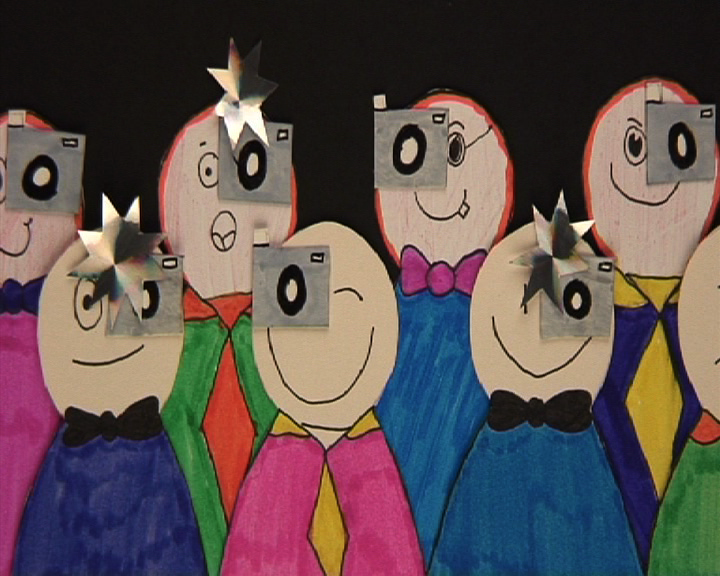 The group had to develop the character in order to find a story for their film. The concept that they settled upon was the idea of a show within a show. 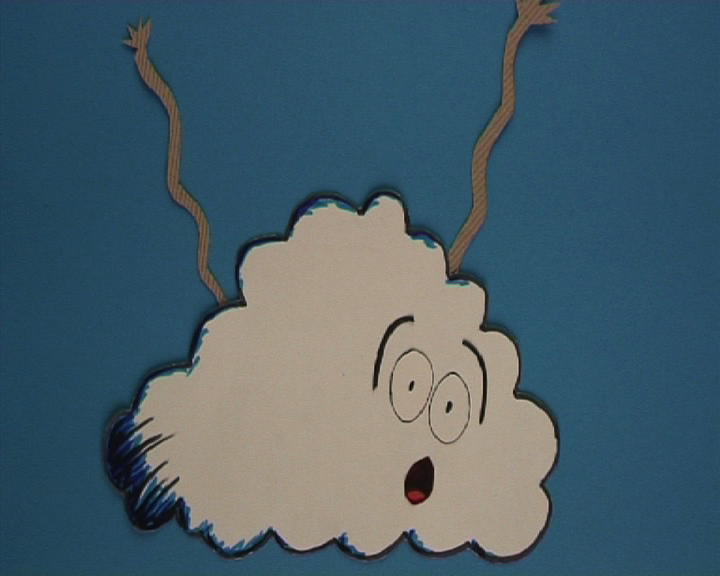 Happy Cloud became the star of a children’s television series. 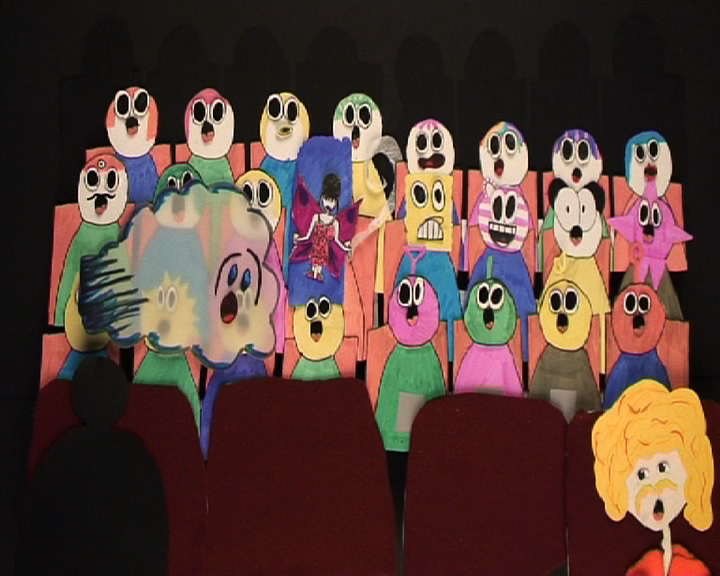 We animated the film using paper cut out animation techniques. 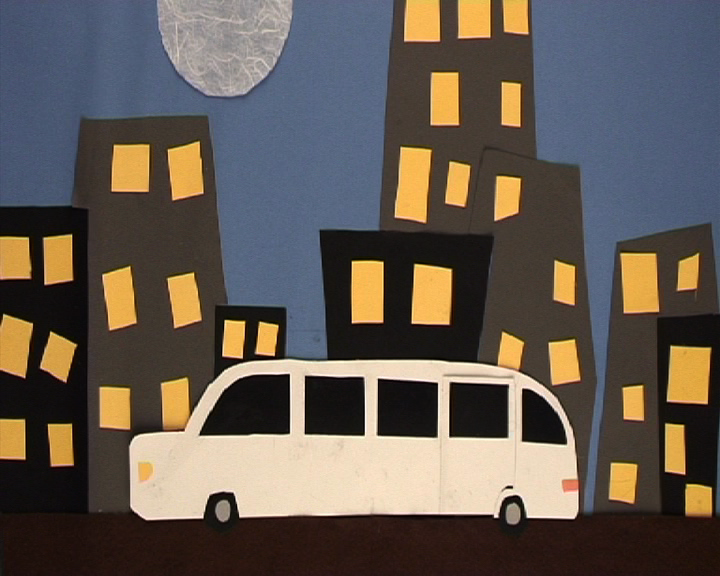 We created backdrops and characters using bits of paper, plastic and fabric that we manipulated and swapped between each shot. 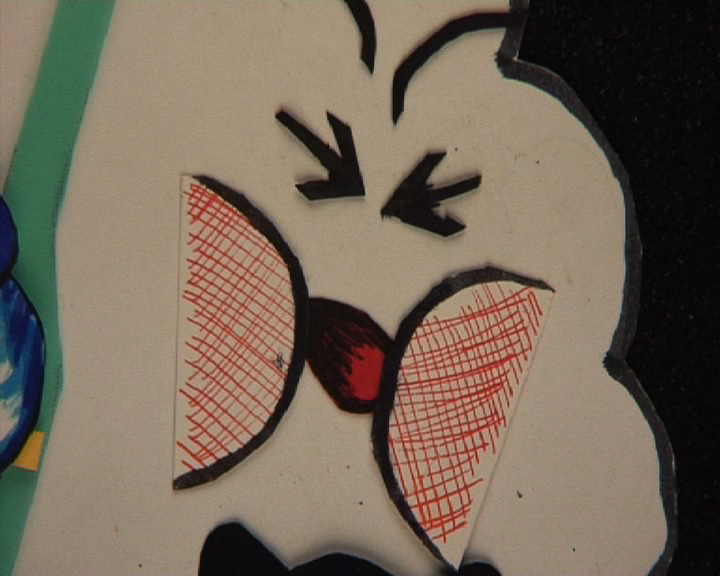 The whole film has a flat, simplistic style. 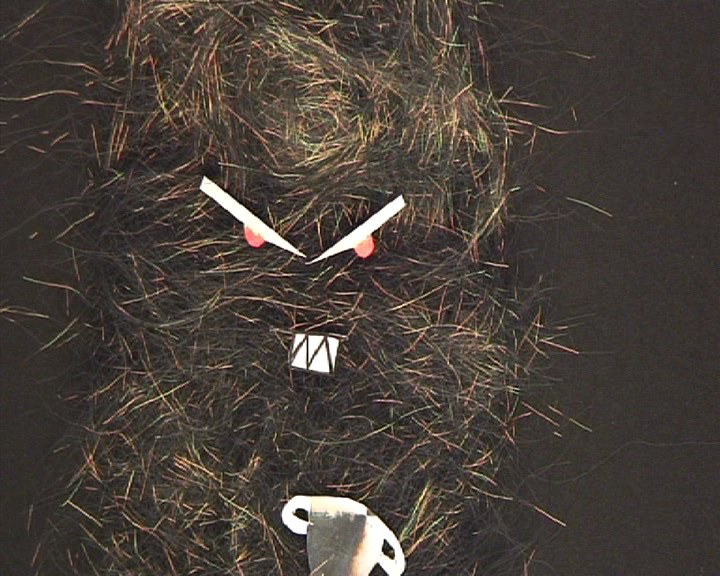 I really enjoy paper cut out animation as you have to think in different dimensions to stop motion puppetry. Although it looks easier, there are far less options available to you for movement and so bringing things to life can be quite a challenge. 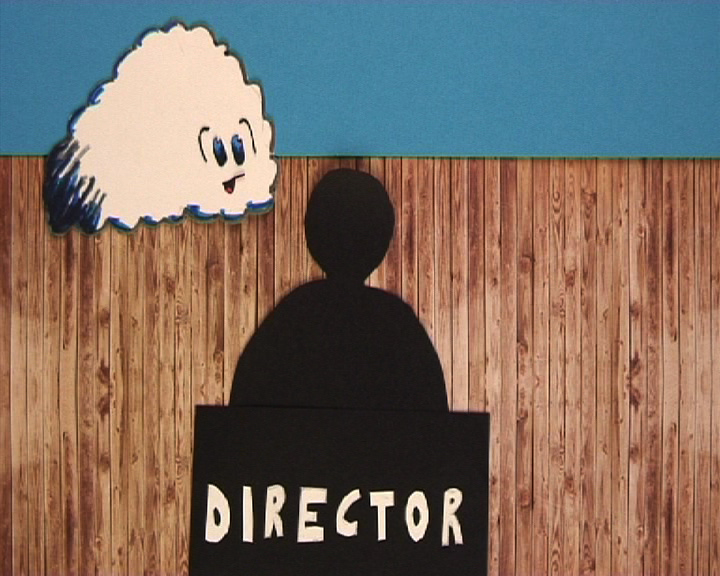 The idea for Happy Cloud’s TV show was to create a playful and colourful world in the style of narrated cartoons such as the Mr Men and Mr Benn. 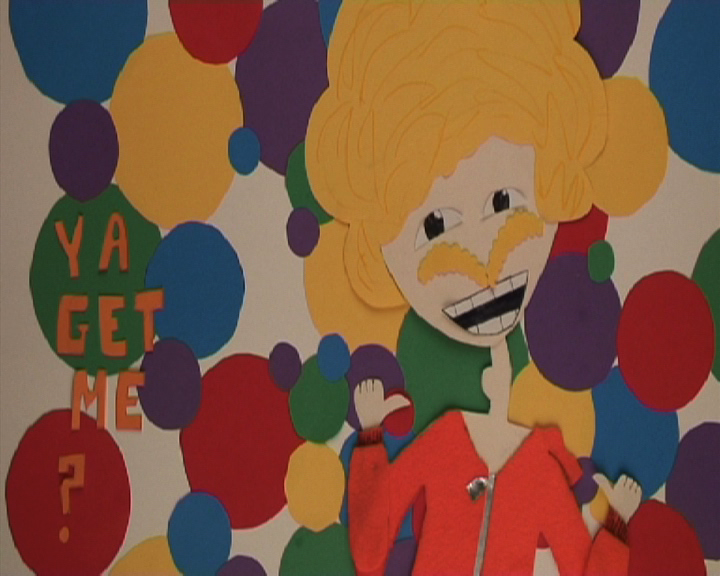 The group decided that this would be a pastiche of children’s TV’s patronising tone and inane characters. 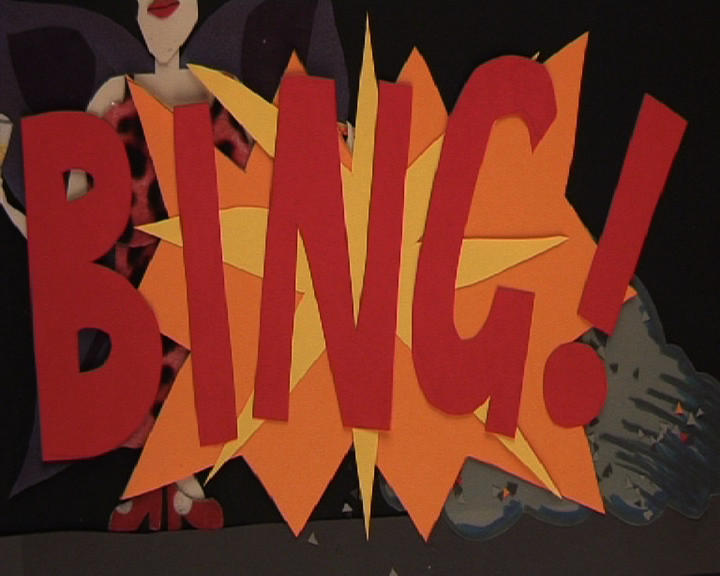 We designed a title sequence for the show that would introduce the characters and the premise of Happy Cloud’s TV show and serve as an intro for our film, before pulling back to reveal the set, leading the audience into the ‘real’ world of the film. Happy Cloud’s narrator speaks over the titles describing Cloud Land as the happiest place in the world, where ‘Happy Cloud makes everyone happy.’ To demonstrate Happy Cloud’s powers, we designed a factory conveyor belt of people forcibly being made happy one by one by Happy Cloud. 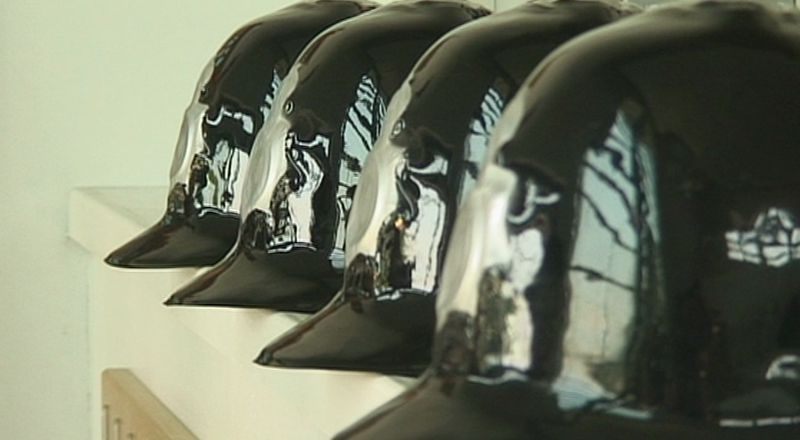 We wanted to establish the subversive tone of the humour from the outset. Happy Cloud’s character also needed fleshing out. A cloud who is happy isn’t much to work with. With that in mind the group thought about subverting the idea. 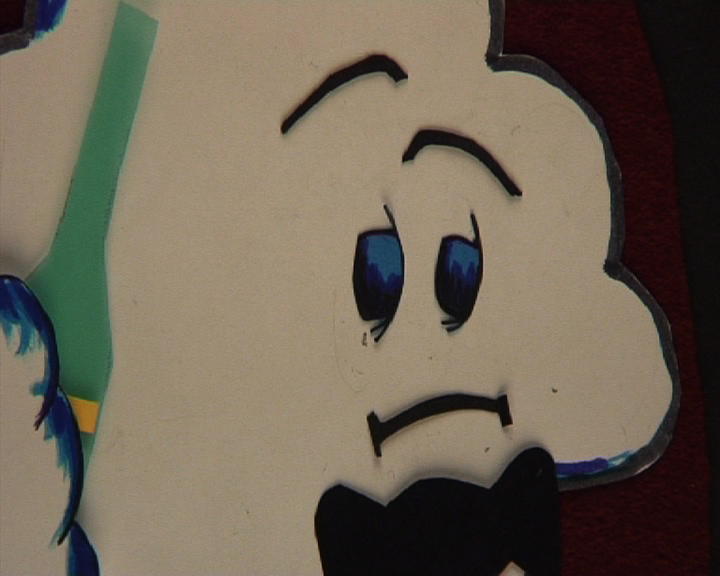 They decided that to the viewers of his show Happy Cloud would seem like the perfect role model for children, but only until the cameras stopped rolling. 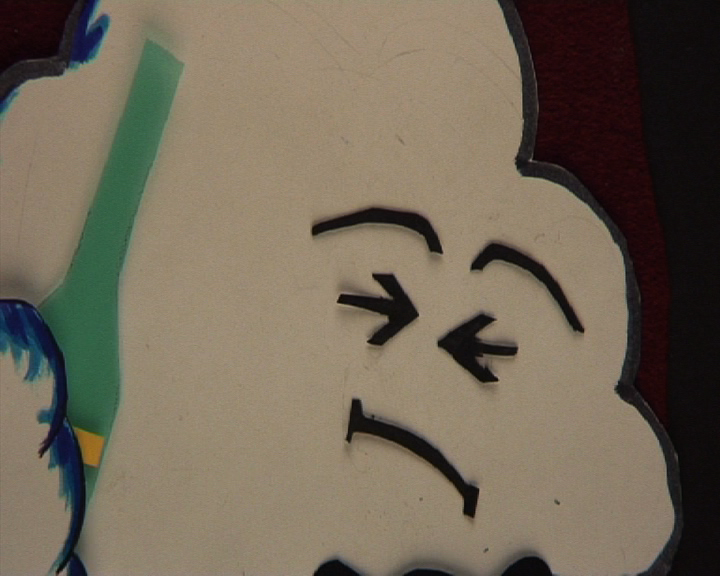 ‘Offscreen’ Happy Cloud is the pampered star of the show – grumpy, vain, money hungry, alcoholic and demanding. We created three different sizes of Happy Cloud to allow us to alter his proportions to suit each shot’s requirements. 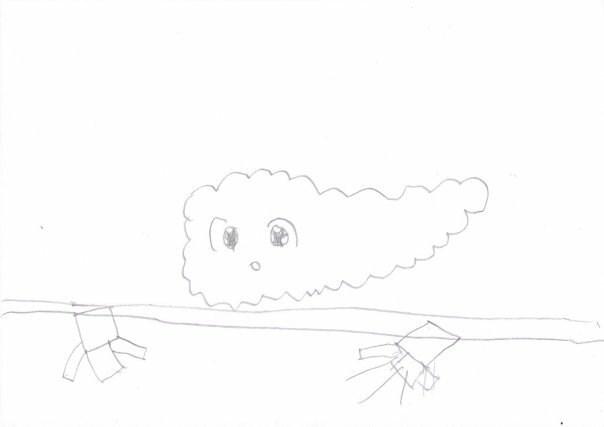 We then turned our attention to developing a cast of characters around Happy Cloud. The first was his co-star and onscreen nemesis Storm Cloud. 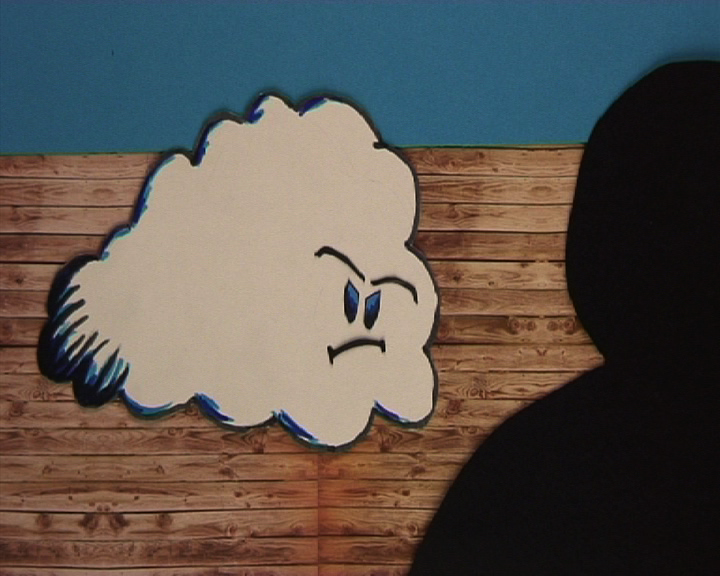 We designed Storm Cloud as a foil for Happy Cloud. Storm Cloud looks tough but isn’t. 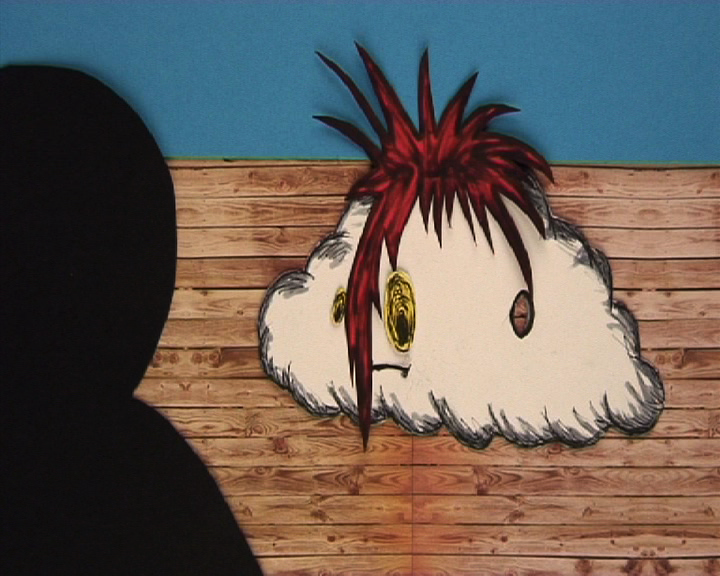 He is a somewhat depressive character who gets pushed around by Happy Cloud. Next we designed the Director of the show. The Director is the voice of authority for the characters, almost a parent figure. We decided to only show him in silhouette to give him a mysterious anonymity. The main conflict of the film comes into play when the Director brings in an image consultant to give the show a ratings boosting makeover. 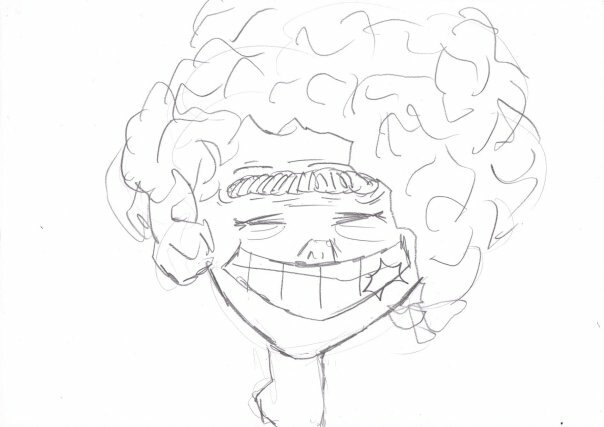 He introduces Jiggy Bigwig, an enthusiastic character who claims to be down with the kids. 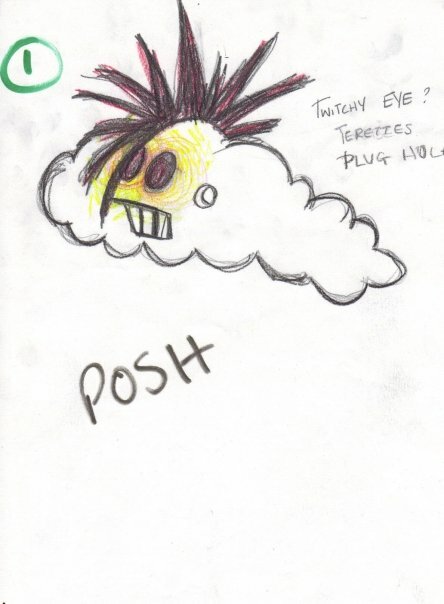 The team had a lot of fun writing and designing Jiggy’s character. They envisioned a man who wears clothes that are far too young for him, tries to act like he is still a kid but is hopelessly outdated and clueless. One of Jiggy’s quirks is his attempts to speak like young people so we made a point of highlighting some of his jargon in cut-away shots. 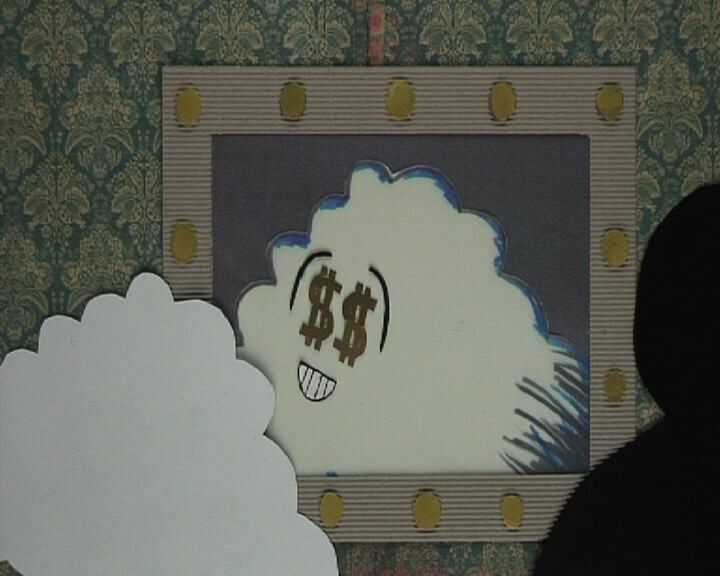 Happy Cloud hates Jiggy but is convinced to accept his input when the Director hints that it could lead to more money and awards for the show. 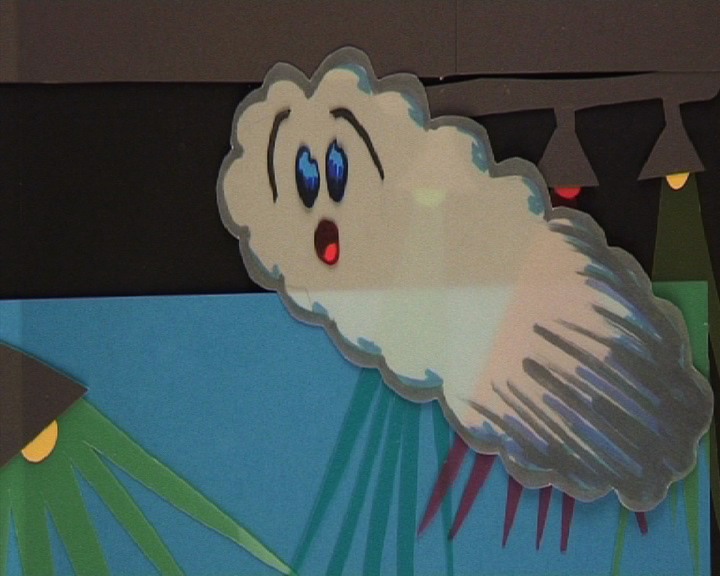 Then there is an accident on set which sends Happy Cloud crashing through the stage. 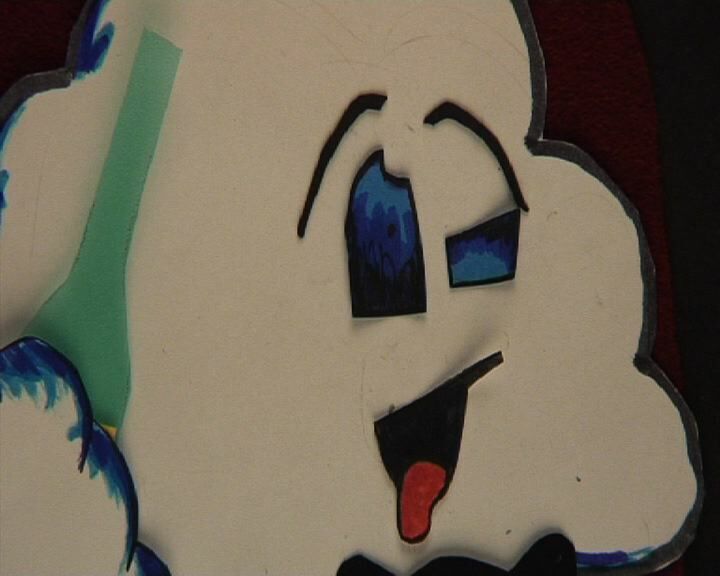 Unconscious, Happy Cloud has an out of body experience, floating up from the stage as a ghostly form of himself. 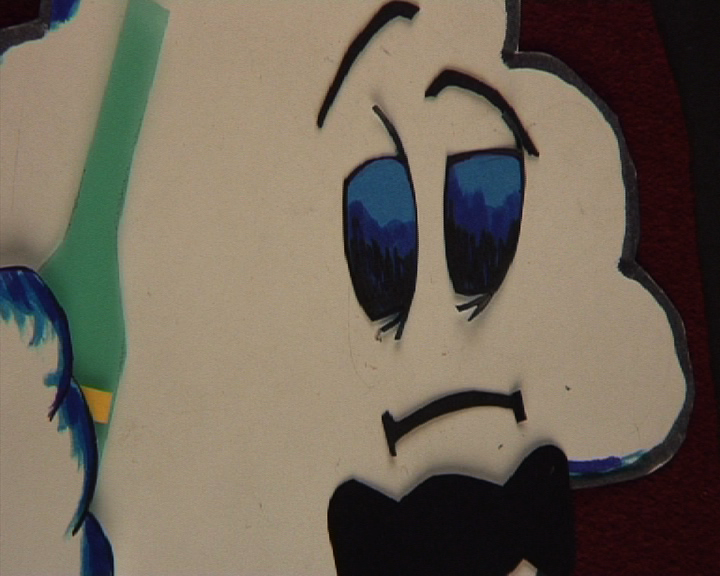 We had fun designing the Ghost Happy Cloud, who we made out of translucent paper to give him an ethereal quality. 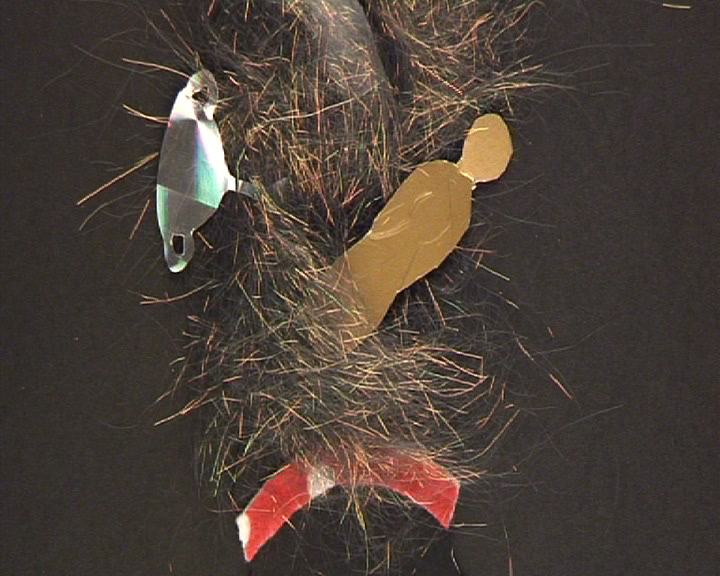 He meets Zany Funhouse, the awards fairy, who acts as his Ghost of Christmas Future to show him the error of his ways. 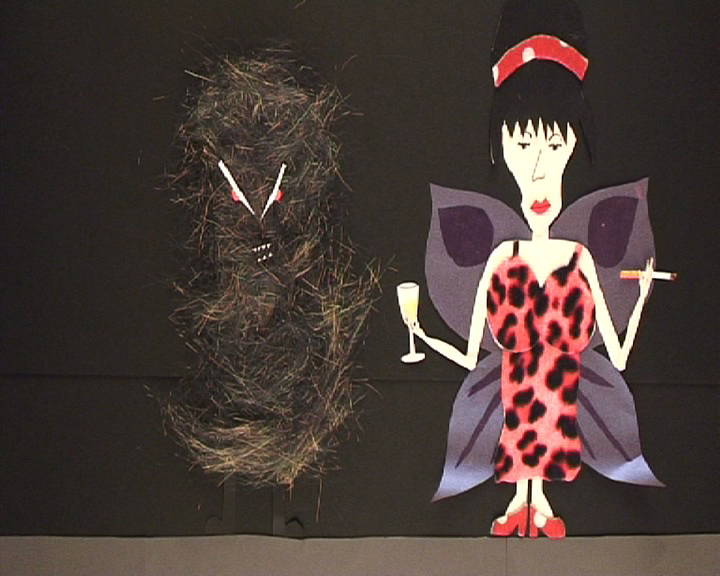 Zany was partly modelled on Amy Winehouse (this was 2009) and styled as a partied out veteran of awards ceremonies with a tall beehive of hair that’s full of trophies and awards statues. We decided to introduce Zany with a slow tilt, travelling up and up and up to emphasise the impossible height of her beehive hair. The hair felt a character in itself, so we decided that for an added punchline we’d make it exactly that, giving it a face and making it growl and jump off of her head at the end of the shot. Zany waves her magic wand and whisks Ghost Happy Cloud away to see a vision of his future. 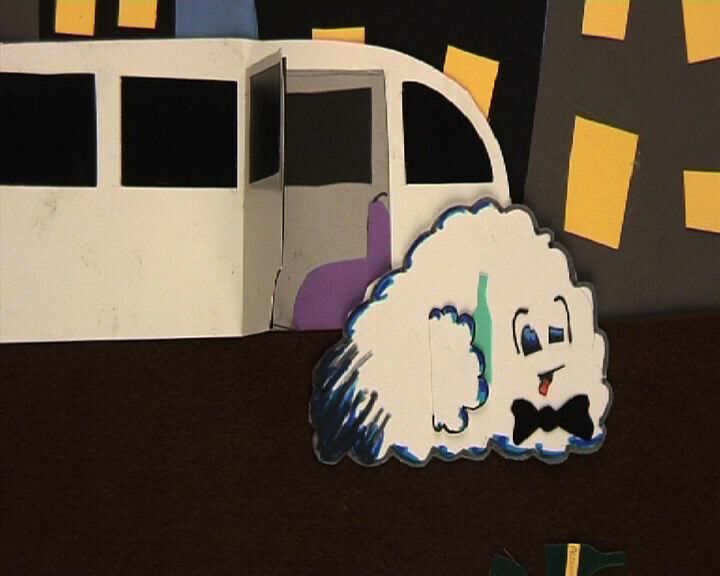 Ghost Happy Cloud finds himself at a glitzy awards ceremony, watching his future self arrive in a limo. 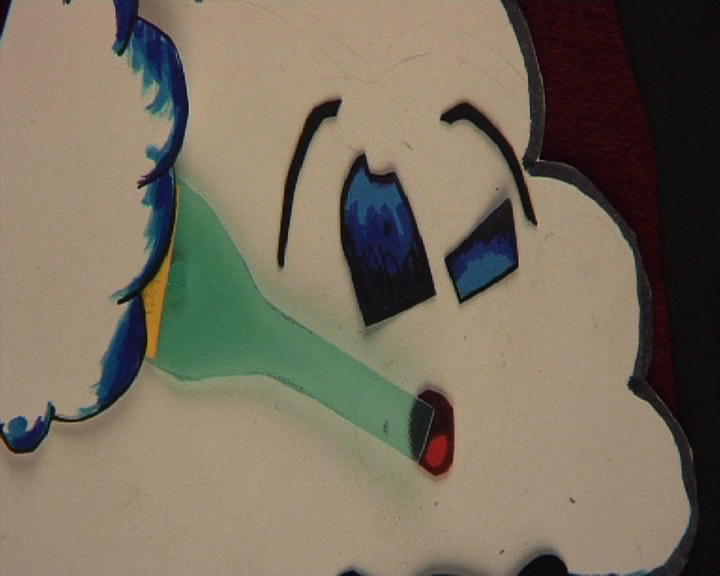 This is my favourite shot in the film, as drunken Happy Cloud tumbles out of the limo. 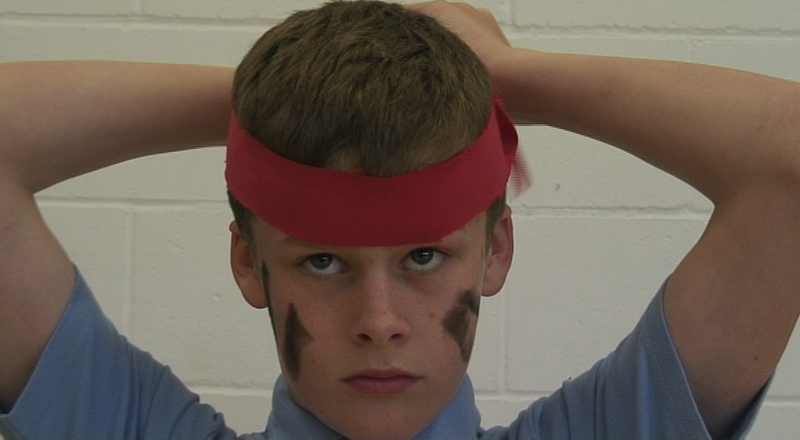 Happy Cloud’s anarchic behaviour was great fun to film and is taken to the next level by voice actor Ben Simpson. One of the features of the red carpet scene was the paparazzi, snapping pictures at the side of the red carpet. We designed something very simple of this, using two rows of people and then moving holographic silver paper in and out of each frame to represent the camera flashes. We envisioned the awards ceremony as the Oscars for the cartoon world and wanted the celebrity audience to be filled with cartoon characters. 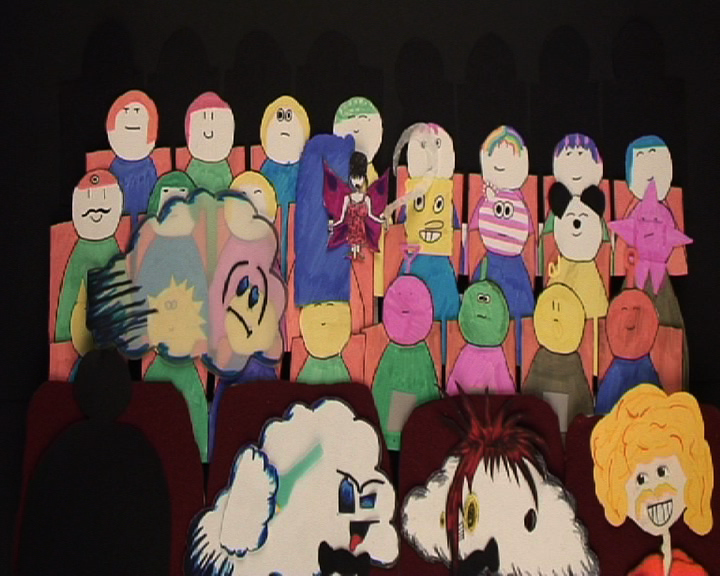 The group designed several members of the audience to resemble popular characters. 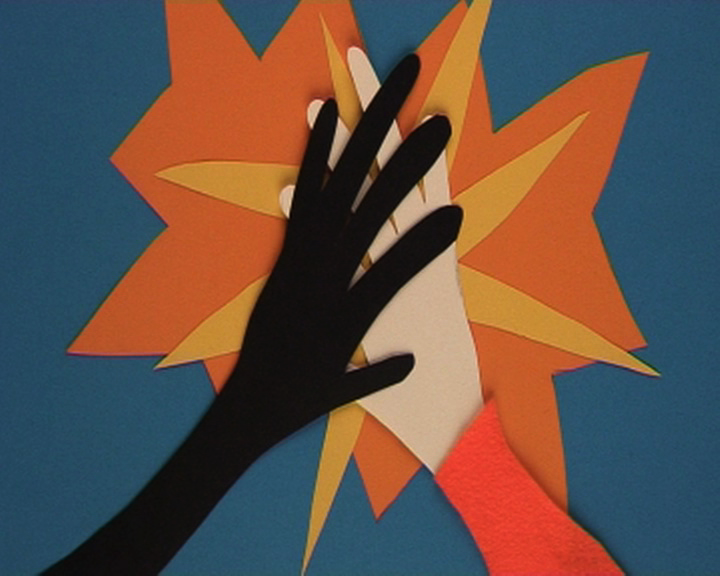 Paper cut-out animation works by moving pieces of paper, or changing and substituting them frame by frame. Substitution is particularly effective for facial expressions and dialogue. 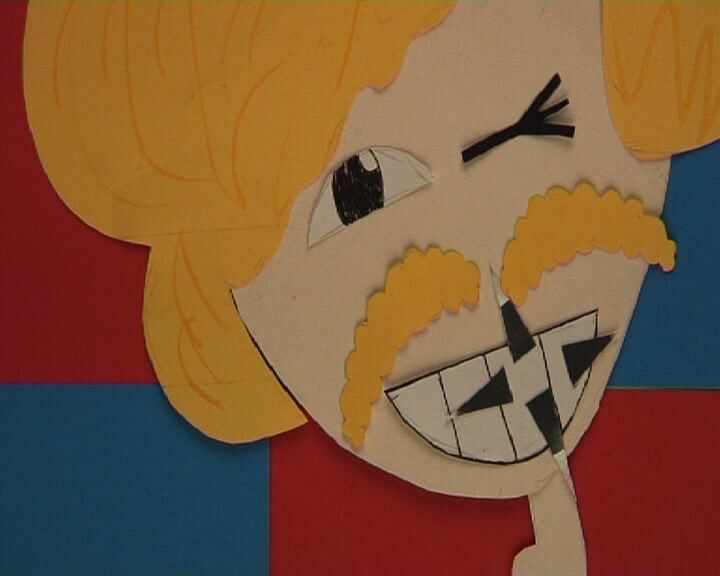 We had a range of eyes, eyebrows and mouths in different expressions and mouth shapes for each character which we then duplicated for each different sized version of the characters. The screenshots below show the range of facial features we used to make a drunken Happy Cloud falling asleep at the awards ceremony. 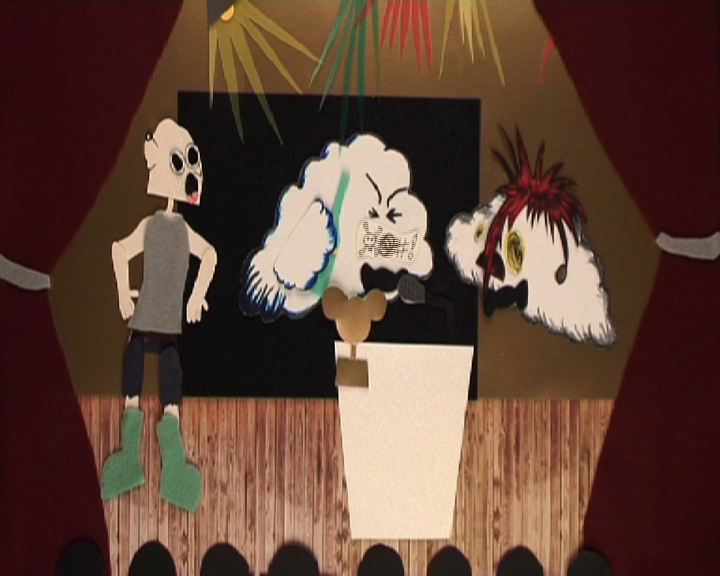 With Happy Cloud asleep, Storm Cloud has to accept the award on Happy Cloud’s behalf, but just as he is doing this, Happy Cloud wakes up and storms the stage, hurling abuse at Storm Cloud and the shocked audience. Then, to make matters worse, he throws up. 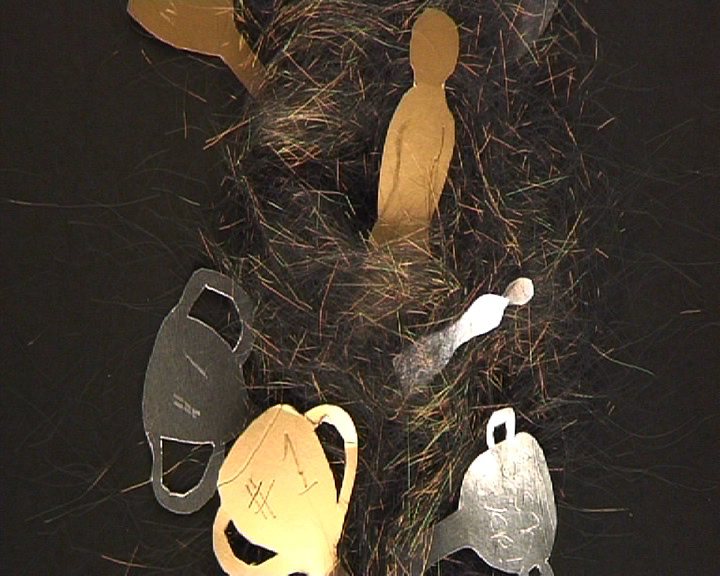 Thanks to First Light, the film has been screened at film festivals around the world and picked up the Small Film Award at Canterbury Anifest 2010. 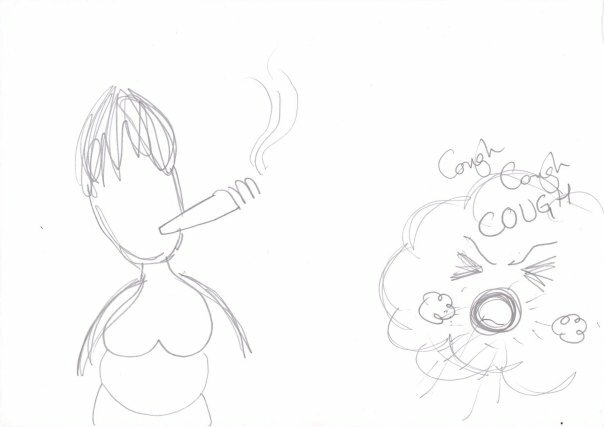 If you want to see more from behind the scenes then have a look at how the finished film compares to the animatic. 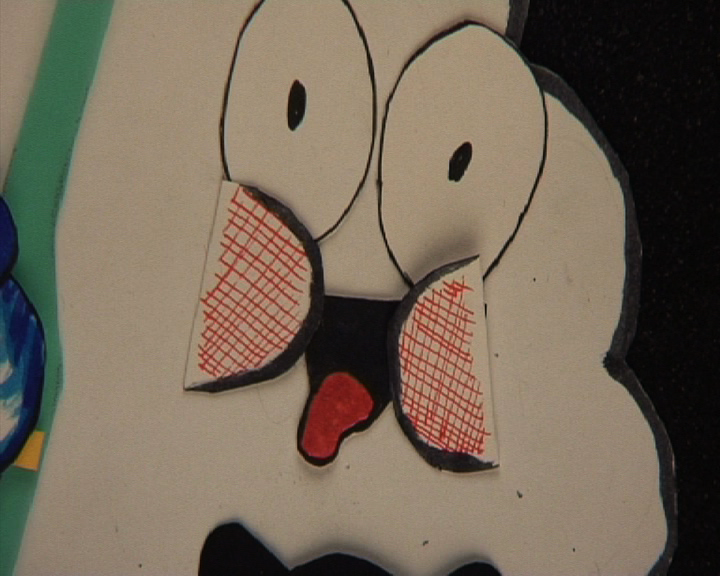 The opening sequence in particular is very close to how we shot the finished version. An animatic is when you put your storyboard together on a timeline to work out things like pace and timing. 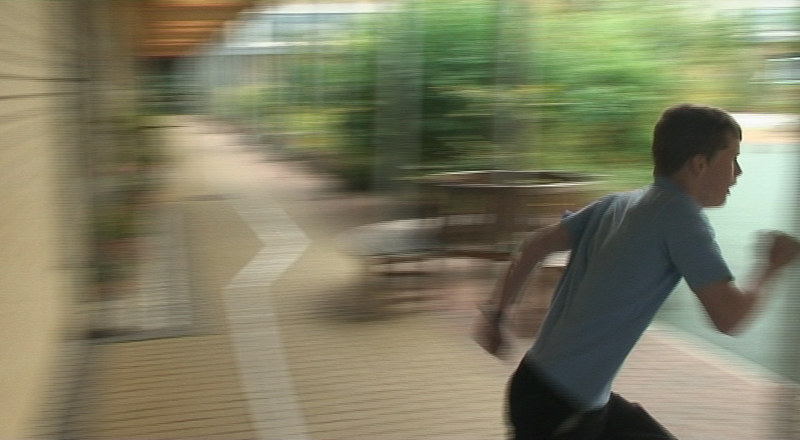 It can include test shots and sound, although we recorded our sound after the animation shoot. 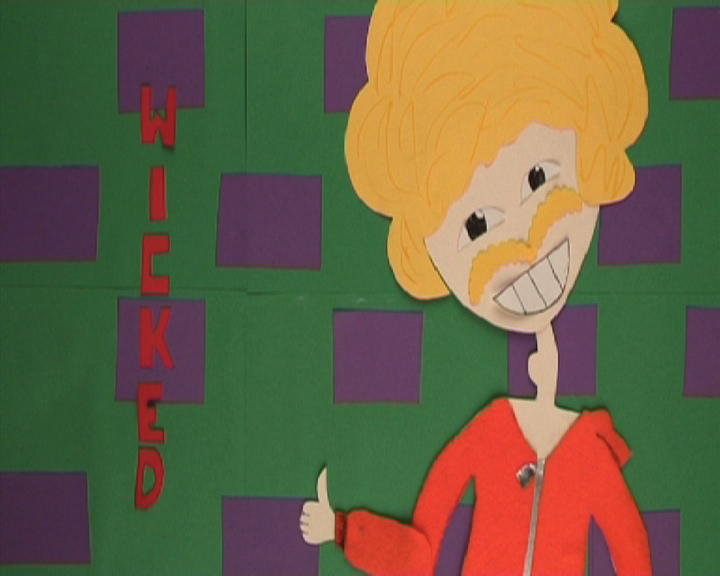 On a larger production the animatic can be used to fill in gaps when full scenes haven’t been shot yet. 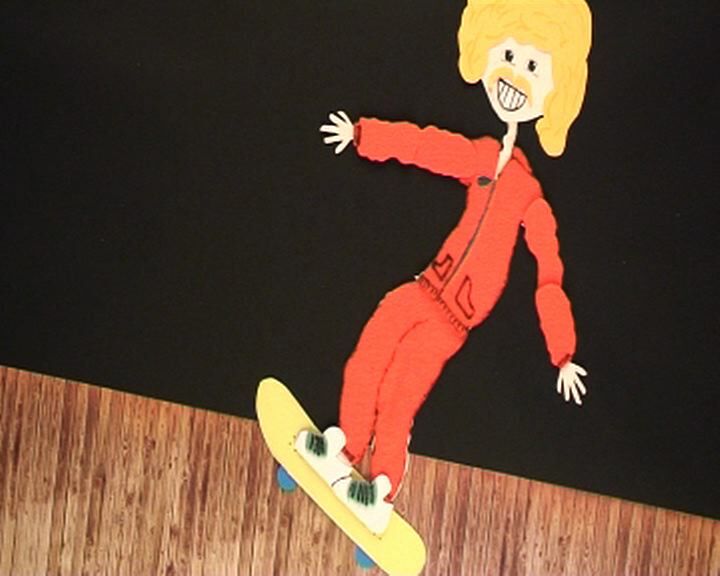 You might notice shots in the animatic that weren’t included in the film. This is because we had to cut a couple of scenes from the script to fit our shooting schedule. If you’d like to learn animation techniques, or want to produce an animated film, please check out my website to see how I can help. This entry was posted in Animation, Portfolio, Youth Project and tagged Animation, animation techniques, Art Direction, Art Director, Awards, Best Comedy, Bill Nighy, Canterbury Anifest, Cartoon, Character design, Clouds, Comedy, Cut Out, Cut Out Animation, Evan Wilkinson, evanmakesfilms, evwilko, First Light, First Light Awards, Happy Cloud, Inbetweeners, Nick Frost, Paper, Paper Cut Out, Production Design, Short Film, Simon Bird, Slapstick, Worthing Youth Media, Youth Project on June 4, 2013 by Evan Wilkinson.